Students getting on the N-E RIDE shuttle in front of Othmer Hall in Lincoln. Twice a week, Pranav Shakya, Steven Stauffer and Ebrahim Mohammadi arrive at Othmer Hall shortly after sunrise and stand along the curb on the north side of Vine Street, waiting for a ride to class. 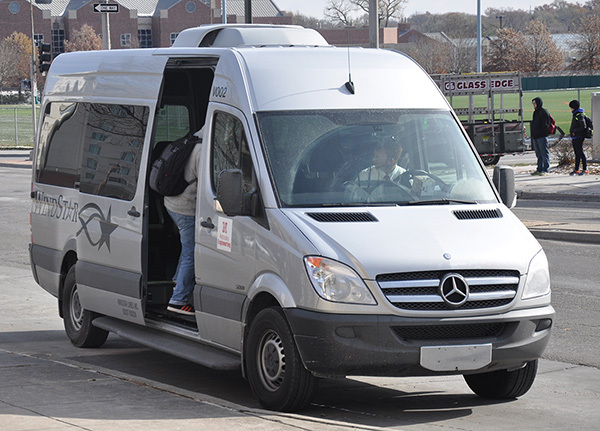 The Lincoln-based civil engineering graduate students know the N-E Ride shuttle service, which began late in the fall semester, isn’t just a transportation option, it’s giving them academic options that otherwise wouldn’t have been possible. Without the shuttle, Stauffer said, obtaining a master’s degree might have been a longer process or might have required taking spring semester classes that don’t fit as well with his academic focus. The idea for the shuttle service originated from graduate students who discussed the possibility with Lily Wang, the associate dean for graduate programs and faculty development and a professor in the Durham School of Architectural Engineering and Construction. The N-E Ride shuttle service features two 11-passenger vans that travel between Othmer Hall on the Lincoln City Campus and the Peter Kiewit Institute in Omaha. Each day, the shuttles make three circuits, starting at 8 a.m.
Other stops include the Park and Ride lot off Exit 439 of Interstate 80 and the University of Nebraska Medical Center. In the event that either the Lincoln or Omaha campus is closed down, the shuttle service will not run. The complete schedule can be found at engineering.unl.edu/n-e-ride/ and on apps that are available for Apple and Android devices. The app also provides a real-time map that shows the location of both shuttle vans. For years, Wang had been encouraging her graduate students from Omaha to take a mechanical engineering class that was only offered in Lincoln. To convince them to make the trip, Wang said, she sometimes had to find incentives to convince them to make the trip twice a week. “In the past, I’d feel guilty about it and I’d try to find ways to cover their gas or to buy the books for them,” Wang said. After speaking with a number of other graduate students who wished to have easier ways to travel between campuses, particularly international students who are less likely to own cars, Wang suggested to the college's leadership team that they look into a shuttle service that would not only allow students but also faculty and staff an opportunity to travel easily between the Lincoln and Omaha campuses. The idea, Wang said, seemed to find some traction, especially with Dean Tim Wei. "I think this idea resonated with the Dean because he is intent on bringing the campuses together," Wang said. "Another priority is tying our college closer to UNMC to strengthen our biomedical research initiative. We have grad students who are working there and believe this service could get them there more easily." With the N-E Ride shuttle, Wang said, three of her students this semester are making the trip from Omaha to Lincoln for the class. The service has proven to be popular since it transitioned from a "soft opening" for faculty and staff in late October, to being opened to students in early November. In four weeks of operation from Nov. 30, 2014 through Jan. 16 of this year, there were 820 individual rides between the campuses -- an average of about 41 per day. The service has been a benefit to many faculty and staff who must travel, especially since the available wireless internet connection allows them to do work while they travel. "They (students) say it's nice the shuttle has wi-fi, and I have benefited from that, too," Wang said. "I find that I can catch up on emails and other things. It really has helped me be more productive." The greatest opportunities available because of the service, however, may belong to students. Many of them are getting involved in groups and taking classes not offered on their home campuses or only via TV or internet connections. However, a few tweaks and compromises were necessary to make these opportunities work for the students. Shakya, Stauffer and Mohammadi go to Omaha on Tuesdays and Thursdays to take a 9 a.m. civil engineering class taught by assistant professor Jinying Zhu at PKI. Five other Lincoln-based students are also traveling by car to Omaha for the class, but because the N-E Ride shuttle doesn't arrive there until 9:10 a.m., Zhu agreed to delay the start of class by 15 minutes. "This may not work for all courses. The reason I can do it is because I have a three-hour lab session on Thursdays and can make up the time because I have flexibility with the lab," Zhu said. "An ideal solution would be for the shuttle schedule to be adjusted to allow the students to make the 9 a.m. class or other class start times. After only three weeks (from the start of the semester), so far it's been good." Wang has proposed that departments could also schedule classes that draw students from both campuses at timeslots that work with the shuttle schedule, since class start times on each campus vary greatly and it would be difficult to optimize the shuttle service for all course timeslots. When the spring semester is over, Wang said, the college will assess the success of the N-E Ride shuttles and consider making changes. Among them could be adding or cutting departures and changing departure times. "We decided we would try it through May and then review it," Wang said. "I think it's been a success so far. People are using it, and there are certain times that are most heavily used – they tend to be the first shuttle of the morning and the last couple of the day." Stauffer said his experience is most likely "a one-shot deal," but having the N-E Ride shuttle available will make him consider a wider range of class opportunities. "I know one of the classes I will take is in Lincoln next semester and the other is offered through the TV," Stauffer said. "I probably won't be doing this after May, but who knows. Omaha classes aren't off the table anymore."